• Wheel bearing axial end play: refer to RAX-12, "Inspection". Camber : Refer to RSU-37, "Wheel Alignment". • If camber is outside specified range, adjust with adjusting bolt in rear lower link. Refer to RSU-21, "Adjustment". Total toe-in = A − B Total toe-in : Refer to RSU-37, "Wheel Alignment". • If toe-in is outside specified range, adjust with adjusting bolt in upper link and lower link. Refer to RSU- 21, "Adjustment". • Adjust camber first, then adjust toe-in last. never change the order. • If camber angle needs to be adjusted, toe-in adjustment is necessary. 1. Loosen mounting nuts of upper link and lower link on the suspension member side. 2. Adjust camber and toe-in by turning upper link adjusting bolt (1) and lower link adjusting bolt (2) alternately. Upper link adjusting bolt Positive direction : Upper link slides into inner side of vehicle. Negative direction : Upper link slides into outer side of vehicle. Lower link adjusting bolt Positive direction : Lower link slides into outer side of vehicle. Negative direction : Lower link slides into inner side of vehicle. - Obtain the amount of camber and toe-in by calculating the difference between the measurement result and the standard value. 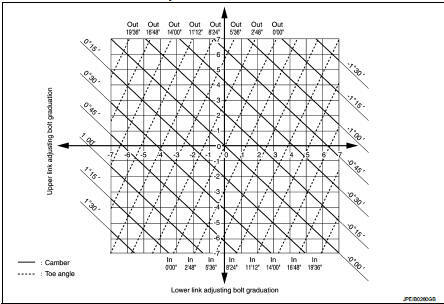 - Obtain the needed adjustment amount from the graph and move adjusting bolts, respectively. 3. After adjustment, tighten mounting nuts of upper link and lower link on the suspension member side. When tightening nut to the specified torque, the bolt must be fixed with a wrench.